Contains a set of screw tabs for the hole punch. Wubbers® Designer Half Round Mandrel Pliers. These are the small size with one half round tip 4mm wide and the other 6mm. They are ideal for making shaped bails, D-ring shaped clasps and jump rings as the tips on these pliers are the same size for the whole length. For use with dead soft sheet 24ga or finer, dead soft wire 16ga and finer. 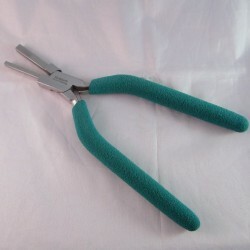 Wubbers® Designer Square Mandrel Pliers. 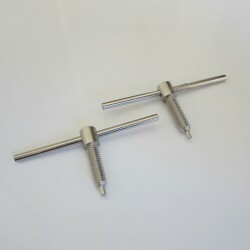 These are the small size with one square tip 3mm wide and the other 5mm. 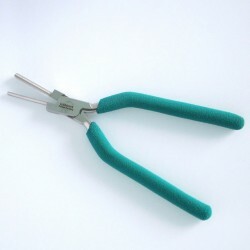 They are ideal for making square shaped bails, wrapped loops, eyepins, jump rings and coils as the tips on these pliers are the same size for the whole length. For use with dead soft sheet 24ga or finer, dead soft wire 16ga and finer.